For the first time, astronomers have caught a pulsar in a crucial transitional phase that explains the origin of the mysterious millisecond pulsars. These pulsars spin much faster than expected for their old age, and astronomers believe their rotation receives a boost as they accrete matter in a binary system. The newly found pulsar swings back and forth between accretion-powered X-ray emission and rotation-driven radio emission, bringing conclusive evidence for their 'rejuvenation'. The discovery was made possible by the coordinated efforts of ESA's two missions that scan the high-energy sky: INTEGRAL and XMM-Newton. Pulsars are the highly magnetised, spinning remnants of massive stars and are primarily observed as pulsating sources of radio waves. The radio emission is powered by the rotating magnetic field and focused in two beams stemming from the magnetic poles. As the pulsar rotates, the effect is similar to that of a rotating lighthouse beacon, resulting in distant observers seeing regular pulses of radio waves. The emission mechanism of pulsars transforms kinetic rotational energy into radiation, and as this energy is radiated over time, the rotation is slowed down. Whilst pulsars spin rapidly at birth, they tend to rotate more slowly – with periods of up to a few seconds – as they age. For this reason, astronomers in the 1980s were puzzled by the discovery of millisecond pulsars – old but extremely quickly rotating pulsars with periods of a few thousandths of a second. The mysterious millisecond pulsars are explained through a theoretical model known as the 'recycling' scenario. If a pulsar is part of a binary system and is accreting matter from a stellar companion via an accretion disc, then it may also gain angular momentum. This process can 'rejuvenate' old pulsars, boosting their rotation and making their periods as short as a few milliseconds. This scenario relied on the existence of accreting pulsars in binary systems, which can be detected through the X-rays emitted in the accretion process. The discovery of millisecond pulsars in X-ray bright, binary systems in the 1990s brought additional support to this model. But until early 2013, astronomers had not found conclusive evidence of a direct link between X-ray bright millisecond pulsars in binary systems and the radio-emitting millisecond pulsars which they had been investigating since the 1980s. "With our discovery of a millisecond pulsar that, within only a few weeks, switched from being accretion-powered and X-ray bright to rotation-powered and bright in radio waves, the search is finally over," says Alessandro Papitto from the Institut de Ciències de l'Espai (ICE; IEEC/CSIC) in Barcelona, Spain. Papitto led the team of astronomers that detected this key source, which is located in the globular cluster M28. Their results are published in Nature. "With its twofold behaviour, this millisecond pulsar has a similar role to that of the platypus or the echidna in the animal world, which lay eggs but also produce milk to feed their offspring – a living evolutionary link between reptiles and mammals," he adds. The new discovery is based on a fruitful synergy between ESA's two missions probing the high-energy Universe: INTEGRAL and XMM-Newton. INTEGRAL detection at X-ray wavelengths of the millisecond pulsar IGR J18245-2452 with the IBIS/ISGRI instrument. "We first discovered the pulsar's X-ray outburst with the wide-field IBIS/ISGRI imager on board INTEGRAL, which observes large portions of the sky at once. This makes it the ideal instrument to detect transient sources like this swinging pulsar," explains co-author Enrico Bozzo from the ISDC Data Centre for Astrophysics at the University of Geneva, Switzerland. "The INTEGRAL data are provided almost in real-time to the scientific community. This is a crucial feature for planning follow-up observations with other facilities: so we looked at our pulsar in greater detail with XMM-Newton," adds Bozzo. With XMM-Newton's great sensitivity and temporal resolution, the astronomers were able to determine the pulsar's period, which amounts to 3.9 milliseconds. This means that the pulsar spins about its axis more than 250 times every second, clearly identifying it as an X-ray bright millisecond pulsar. "But it wasn't until we compared the spin period and the orbital parameters of this object to those of other known pulsars belonging to the same globular cluster and listed in astronomical catalogues, that we noticed something peculiar must be going on," says Papitto. The astronomers realised that the numbers matched perfectly those of another pulsar that was detected a few years ago – but at radio wavelengths, not in X-rays. The only available observations of this pulsar were published in a graduate thesis in 2006. "Nobody had conducted follow-up observations of that radio pulsar, because it did not seem in any way interesting at the time – it appeared to be just another millisecond radio pulsar," notes Papitto. "But when we compared it to our pulsar, we realised immediately that this source, which had once been bright in radio waves and was now shining in X-rays, was no ordinary pulsar." The astronomers kept monitoring it with X-ray telescopes but also started a series of radio observations. They thought that, sooner or later, the pulsar might change behaviour again and switch back to being bright in radio waves. "What we didn't expect was that this would happen within a few weeks," comments Papitto. The pulsar, which had been first detected on 28 March 2013, was bright in X-rays for the entire month of April. Then, as its X-ray emission started to decline, radio waves were detected as soon as early May. "It was a stroke of luck that the pulsar changed its behaviour on such a short timescale," comments Bozzo. "But it wasn't just good fortune: the synergy between all the observatories involved in this study, and in particular the complementarity of INTEGRAL's large field of view and XMM-Newton's great sensitivity, was crucial for us to detect and correctly identify this object in time." Not only did these observations prove the evolutionary link between accretion-powered, X-ray bright millisecond pulsars and their rotation-driven, radio-bright counterparts, as predicted by the recycling scenario. The data also showed that during this evolutionary process, which may last several hundreds of millions of years overall, the pulsars go through an intermediate phase that involves swinging back and forth between the two states several times, emitting alternately X-rays and radio waves, until finally becoming purely rotation-powered, radio-emitting millisecond pulsars. The astronomers ran a background check on archival data from NASA's Chandra X-ray Observatory, and found that the same source was also bright in X-ray in 2008, and they expect it will flip back again in the next few years. This bouncing behaviour is caused by a rhythmical interplay between the pulsar's magnetic field and the pressure of accreted matter. When accretion is more intense, the high density of accreted matter inhibits the acceleration of particles that cause radio emission, so the pulsar is not visible in radio waves but only through the X-rays radiated by the accreted matter. When the accretion rate decreases, the magnetosphere expands and pushes matter away from the pulsar: as a consequence, the X-ray emission becomes weaker and weaker, while the radio emission intensifies. "The discovery of this transitional pulsar completes a quest that has gone on for a couple of decades," comments Erik Kuulkers, INTEGRAL Project Scientist at ESA. "In spite of the long time required for this detection, we believe that pulsars in such binary systems are fairly common, so we're looking forward to finding more," concludes Norbert Schartel, XMM-Newton Project Scientist at ESA. The results described in this article are reported by A. Papitto and colleagues in the paper "Swings between rotation and accretion power in a binary millisecond pulsar", published in Nature, 501, 517-520, 26 September 2013. The study is based on data from a number of space-borne, high-energy observatories, as well as ground-based radio telescopes. The source IGR J18245-2452 was first detected as an X-ray transient with the wide-field IBIS/ISGRI imager on board ESA's INTEGRAL mission on 28 March 2013. 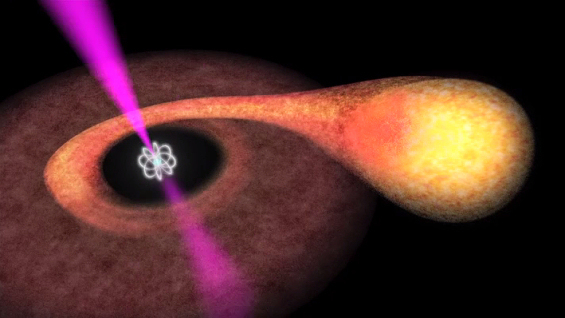 Subsequent observations with ESA's XMM-Newton and the X-ray Telescope (XRT) on board NASA's Swift mission confirmed that this source is a millisecond pulsar with a period of 3.93185 milliseconds. The X-ray outburst activity is caused by the pulsar as it accretes mass from its companion, a low-mass star with a mass around 0.2 times that of the Sun. This millisecond pulsar is located in the globular cluster M28, at a distance of about 18 000 light-years from Earth. Comparison with data from other pulsars allowed the astronomers to identify IGR J18245-2452 with another object that had been observed in the past, the rotation-powered, radio-emitting pulsar PSR J1824-2452I. The properties of this pulsar were reported in the graduate thesis of Steve Bégin, completed at the University of British Columbia, Canada, in 2006. Additional X-ray observations were performed with NASA's Chandra X-ray Observatory in April 2013. Archival data from Chandra of the same field, dating back to 2002, 2006 and 2008, were also available, showing that this pulsar had exhibited variable behaviour in X-rays also in the past. The pulsar has been also monitored in radio waves using the Australia Telescope Compact Array, the Green Bank Telescope, the Parkes radio telescope, and the Westerbork Synthesis Radio Telescope, from April 2013 onwards. The pulsar became active at radio wavelengths again on 2 May 2013. The International Gamma-ray Astrophysics Laboratory (INTEGRAL) was launched on 17 October 2002. It is an ESA project with the instruments and a science data centre funded by ESA Member States (especially the Principal Investigator countries: Denmark, France, Germany, Italy, Spain, Switzerland) and Poland, and with the participation of Russia and the USA. The mission is dedicated to the fine spectroscopy (E/∆E = 500) and fine imaging (angular resolution: 12 arcmin FWHM) of celestial gamma-ray sources in the energy range 15 keV to 10 MeV with concurrent source monitoring in the X-ray (4-35 keV) and optical (V-band, 550 nm) energy ranges.